Baby Rhino Fiona at Baby Rhino Rescue | Adopt and Donate Now! 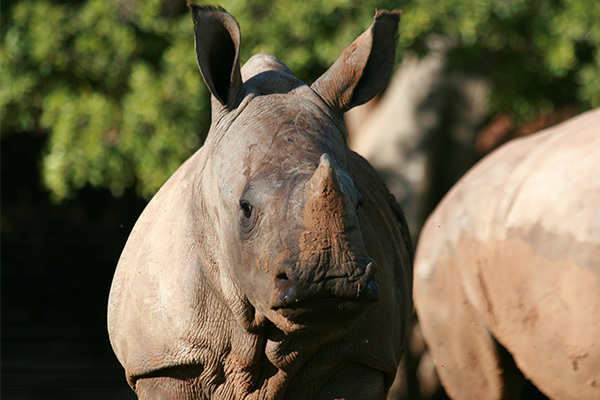 Fiona joined the Rhino Pride Sanctuary when she was 3 months old after the farm where she lived with her mother and father was attacked by poachers. Fiona was born at the RPF but she got "stolen" from her mom when she was a week old by a cow who lost her calf almost immediately after birth. Oddly, her “real” mom didn’t seem to mind, so Dr Pretorius elected to leave her with her new mother, as she was lactating, so there was milk. Her adopted mom loved and cared for her beautifully, but sadly, when Fiona was 6 months old, her mother got encephalitis and died. It was decided to add Fiona to the crash. She settled down quickly, finding herself surrounded by lovely company. She gets her milk a number of times during the day. She knows that come mid afternoon, it is time to wander down to the barn, where her bucket of milk will be waiting.